Creating a cheerful Christmas look has never been easier. 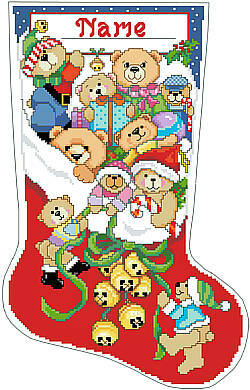 With our cuddly bears stocking design and jolly jingle bells spilling out, you can add a fun touch to you décor, or wrap it up for a gift. This easy-to-stitch piece can be personalized with a child’s name or initials. Contents: Stitch Count 115W X 186h, finished size on 14 ct 8-1/4" X 13-1/2"